Exhausted at the end of the fishing day? free front deck. This recessed trolling tray is the answer. This Aluminum tray can be installed in your boat with a professional looking finish. 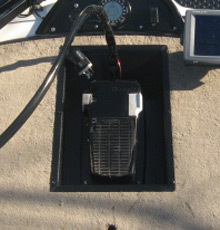 The tray fits both MotorGuide and Minn Kota trolling motors! Give your boat the looks and feel of a 2016 model! Read what others are saying about Troll-Eze!. This trolling motor tray is awesome!!! Great tray! Thanks for the quick shipping! Great value. Easy install once you get past cutting the hole in a new boat. Thx.